A trip of this magnitude is not possible without some help. Two things specifically have made this trip easier or even possible, our iPhone and stroller. Our iPhones have been useful in countless ways. Using the Undercover Tourist Disney World app that show maps of the parks, ride locations, up to the minute lengths of lines, restaurant menus, and parade times. Beyond that movies and shows for the kids have kept them entertained and away from the path of oncoming busses. Instead of screaming, wiggling, and overtired children on a bus we have quiet contained little ones. Lastly pictures and blogs. Without this device we'd have another piece of gear to manage on our trip. The iPhone takes great pictures and video too. With Internet access at the resort costing $9.99 a day we are forgoing Internet for our computer and instead I'm posting the blogs from my phone. Typing on this small screen is slower and more prone to errors but I'm managing. 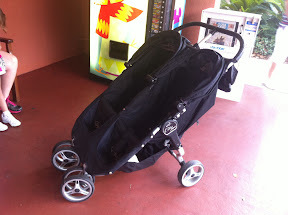 The above tool is a convenience but this next tool is a necessity, our stroller. We didn't want to have to check our stroller on the plane plus we wanted one with the ability to seat two. At the recommendation of www.mousesavers.com we rented a stroller from an off site company for $100 for 6 days of use and that price included $25 loss and theft insurance. For just that bit we got a double wide stroller delivered to our resort, that we can use at the resort, with seats that fold flat, and has three drink cup holders. When we are done we pack it back in it's bag leave it at the front desk and we are done with it. Whereas if you were rent one from the Disney parks it would run us $31 a day for this hard plastic nightmare that doesn't fold flat and can't be used at the resort. 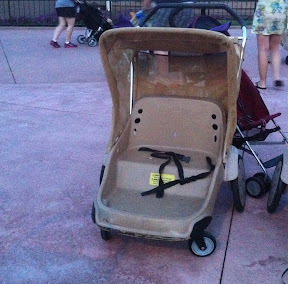 Even though we have a great stroller the kids sometimes won't use it. Luke especially has a dislike for it when he needs it most. In the morning he is all about the stroller but as the day wears on he uses it less and less. We try to let him walk but if we have a long way to go sometimes we have to buckle him in against his will and go.